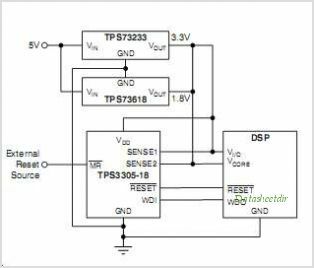 The TPS3305 family is a series of micropower supply Voltage Supervisors designed for circuit initialization. Its dual monitor topology is well-suited to use in DSP and processor-based systems, which often require two supply voltages, core and I/O. This is one package pinout of TPS3305-33,If you need more pinouts please download TPS3305-33's pdf datasheet. This is one application circuit of TPS3305-33,If you need more circuits,please download TPS3305-33's pdf datasheet.